The FEC750 is the largest commercial rotisserie smoker oven in the Fast Eddy's range. 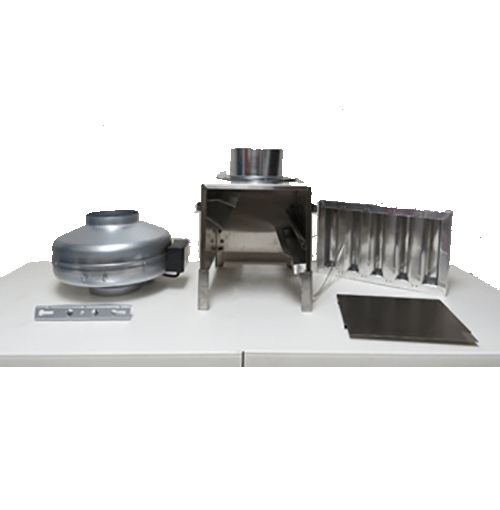 It is ideal for volume production of large cuts such as pork butts or brisket. With a potential capacity of 340kg, the FEC750 smoke-cooks the full range of pit barbecue foods to smoky perfection. In the UK, the FEC750 will typically be used as a production unit in premises with industrial/roller shutter access. As comfortable indoors and out, this unit is ideal for concessionaires catering at major festivals and events. 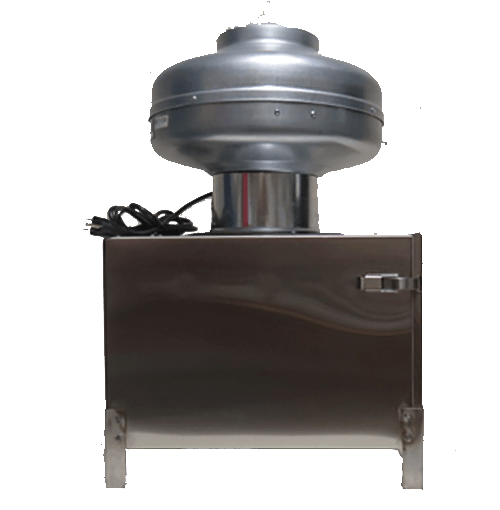 With a fast start up, continuous even heat, and precise temperature control this hardwood pellet smoker will give you consistently delicious hot-smoked products and succulent pit barbecue. Unlike with log-burners, there is no gas flavour aftertaste to overcome. A convection fan housed at the back of the smoker enhances heat and smoke evenly through the oven.. Installation is a snip. Once on site simply roll the FEC750 under an appropriate commercial extraction canopy, plug it in, and off you go! The FEC750 can be fitted with an optional Evacuator to aid extraction. Just remember that additional height clearance will be required to accomodate the smoke evacuator.. 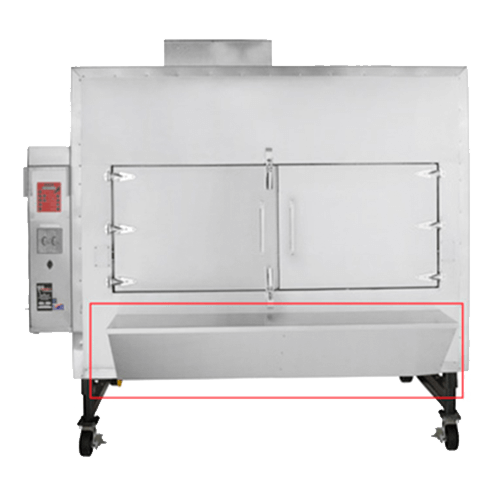 This tough smoker is built on a tubular steel perimeter which will not warp or bend, even if the smoker is moved by a fork lift. It can also be fitted to a dedicated trailer. 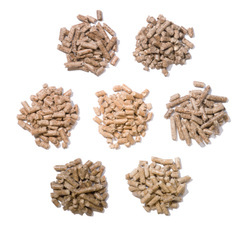 The vast majority of hardwood BBQ pellets are imported from the USA. The most popular varieties in the UK at the moment are Hickory, Fruitwood and Mesquite - but a much wider range including White Oak, Maple, and Pecan are available, allowing you to vreate your own blend and flavour profile. Because hardwood BBQ pellets go through a manufacturing process that eliminates pests and other contaminents, you can cook in the confidence that you won't run a risk of infestation in your workplace. And because they are supplied in bags weighing 9 - 12kg, they are clean to handle and easy to store. We recomment you click on the "Pellets" tab above to learn more about the benefits of cooking with barbecue pellets. 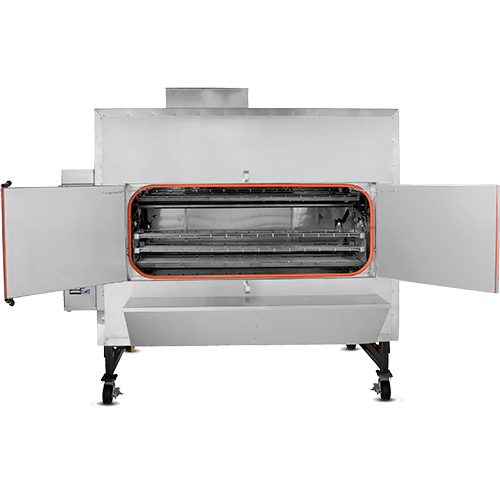 The cost of using BBQ pellets in a FEC750 is typically no more than 150p per hour, which is a lot of meat for relatively few pennies! Double-walled stainless steel construction with 454°C Spin-Glas® insulation, provides superior heat retention and reduces electrical consumption. 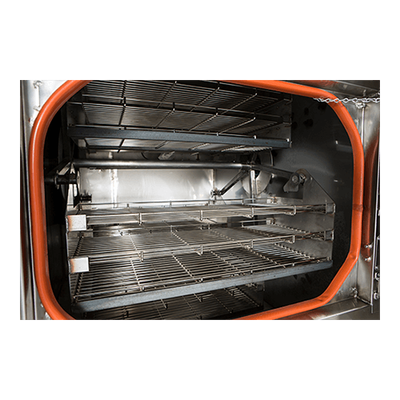 It's design allows sufficient air-flow to enable smoke flavour penetration, without constantly reheating cool air or losing moisture. 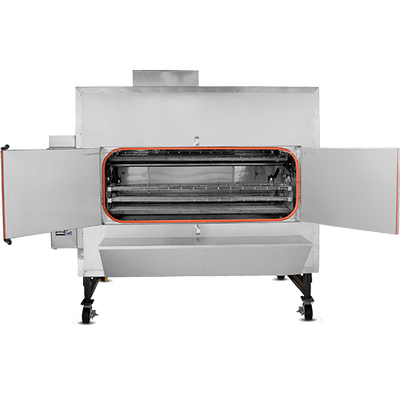 The FEC750 does NOT use gas, which means greater yields and better flavour. The FEC750 pays back quickly! Cookshack's IQ5 electronic time/temperature control system includes programmable, customisable cooking presets, alarm cycle, 16-character LCD display, and USB port for downloading up to 512 hours of cook time onto a FAT formatted USB drive. It features 3-stage and 2-stage cooking options. Even with all these features the controller is easy for any kitchen employee to use, making it a Management dream! Install under appropriate extraction hood. Line smoker bottom with foil, pierce at drip pan outlet. Fill pellet hopper, set the temperature with the IQ5 digital controller, let smoker warm up, load food product. Control rotisserie for loading/unloading product with included foot pedal. 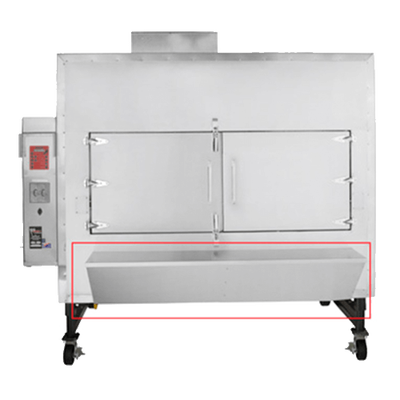 Constant supply of wood-fired heat and smoke means you can access the oven throughout the cook..
Drippings exit the smoker through an user-controlled valve at the bottom of the oven. Rotisserie grillracks easily removed for cleaning. With the easy-to-use IQ5 electronic controller you just set the desired cooking temperature and time and off you go! 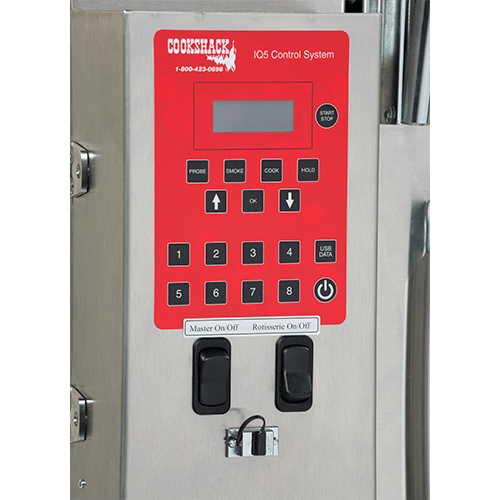 When finished, the FEC750 automatically goes into a hold cycle. This is especially useful when smoke-cooking overnight. Cookshack's IQ5 digital technology comes with 3-stage cooking options, allowing the user to define different temperature and duration settings for a single cook. 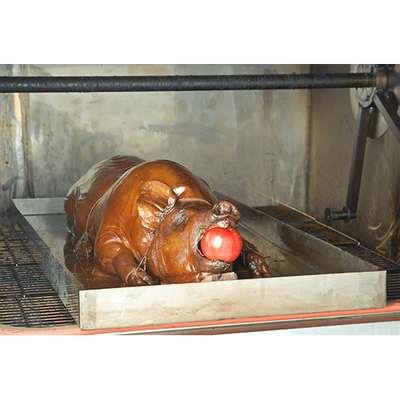 For example, 4hrs really low-smoking at 180°F, followed by 12hrs smoke-cooking at 220°F, followed by 148°F holding. It aslo comes with 9 programmable pre-sets. 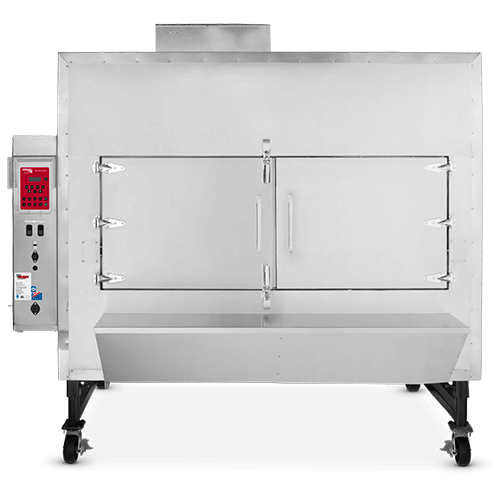 Any competent person can work Fast Eddy's FEC750, making it a dream for busy kitchens and absent pitmasters! 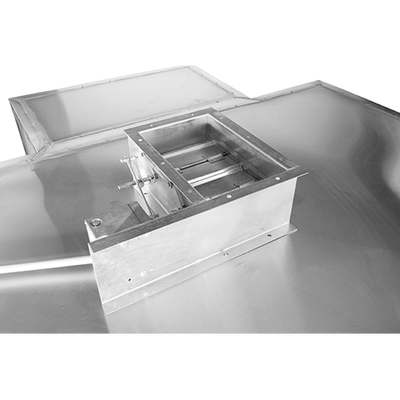 Ventilation is required for the proper operation of Fast Eddy's commercial smokers. The flue should not have more than two ninety-degree elbows in it or be longer than thirty feet. Compliance with local regulations is essential. Adequate makeup air is required for safe operation. It is the responsibility of the smoker owner to maintain essential combustion air at all times during operation of the unit. 130°F to 400°F (FEC120 calibrated in Fahrenheit. Centigrade equivalent: 55°C to 204°C). Temperature range will vary based on the load in the unit. 36kg - allows you to cook overnight (and more) with total confidence. All metric units have been converted from the manufacturer's American Standard measurements. The manufacturer reserves the right to change specification without notice. * Specs based on typical US meat cuts. Capacity will depend upon meat cut/dimensions. UK/EU cuts tend to be smaller. Please use Cooking Surface and Shelf dimensions to determine capacity relative to actual/sourced meat size. ++ Please allow minimum additional 250mm to open Firebox door. All dimensions rounded-up from American Standard measurements and accurate at the time of publication. When you cook with hardwood BBQ pellets you are cooking with wood. Simple. 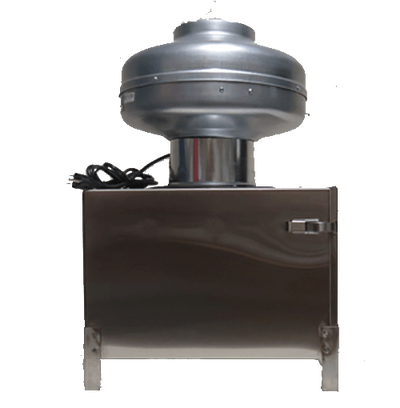 Because hardwood BBQ pellets go through a manufacturing process, both they and their smoke output will be consistant. Unlike with logs. Additive-free 100% hardwood pellets that go through a food-safe manufacturing are available in a wide range of wood-types, including Hickory, Mesquite, Apple, Cherry, Pecan, Oak, etc. The FEC750 is constantly 100% wood burning, for both its heat source and flavour source, so results are consistent. In gas units and stick/log-burners, however, the wood logs get smaller as they burn, which means when new product is added, new wood must be added too. And since product is cooking while new wood is added, flavour will be affected. With continuous use, the FEC750 produces about 200g of ash per 18kg of pellets used - a fraction of the ash produced by logs. Danger of a fire from removing hot ash and embers is eliminated, unlike log burners that typically require removal and safe disposal of live embers. Storing clean plastic bags of pellets is far more desirable than having a woodpile on the premises - especially if the EHO requires it to be sprayed to contol insects, fungal growth, etc.! Pellets are easily obtainable, inexpensive, and easy to store; available in a variety of wood types. The best pellets are 100% food grade wood without no binders, additives, or "secret ingredients". Unlike natural gas or propane, which are fossil fuels, pellets are a renewable resource. Pellets produce low creosote buildup so that the smoker walls require less frequent cleaning. Loading pellets into the FEC's hopper is easy — just pour them in straight from the bag.